Our Essential Rewards Freebies this month are perfect for everyone starting out the new year by exercising more and taking better care of their physical health! These oils are great for breath support during workout, as well as post-workout recovery. However you choose to enjoy this refreshing oil, make sure you get yours free by ordering 100PV on your January Essential Rewards order! This blend is for soothing your muscles, no matter what you did to make them scream! You can use your reference guide to learn more about how miraculous Helichrysum this is one of my favorite oils for all sorts of body repair. So if you are joining the gym for the New Year or just need a blend that will love on your muscles - THIS IS IT! Plus, with your 190PV Essential Rewards order, you will also receive the free bottles of Spearmint and Super Cal Plus! Get all these amazing benefits when you place a 190PV order on Essential Rewards! Plus you will also receive the free bottles of Spearmint and Deep Relief! Any temporary discomfort, PanAway is your answer! Sitting at your day job, driving or flying long distance, or jogging at the gym, your feet, legs and calves will LOVE the attention. Go grab your resources and look up what Helichrysum, Clove, Wintergreen, and Peppermint do - these are all the single oils in this blend. Try diluting with a carrier oil to cover more surface area. PanAway feels great on all the muscles! This is probably one of the first oils from your Starter Kit that got all used up! So this month make sure you get a FREE 15mL bottle of PanAway when you place a 190PV order on Essential Rewards! Plus you will also receive the free bottles of Super Cal Plus, Deep Relief, and Spearmint! You'll remember Copaiba from your Premium Starter kit too. A weird name, but an amazing oil, and with this freebie you'll get the larger 15 mL bottle! Topically this oils works wonders for your skin, it is soothing and calming and great to rub on top of other oils to boost their supportive effects. As this oil is also part of the Vitality line, another effective way to use Copaiba oil is internally. A drop under your tongue or a few drops in a capsule during times of high stress can be a game changer. It is an oil that literally calms and centers you within minutes. Using this oil BEFORE a stressful situation is a great technique to get used to. Add it to any beverage, and you'll hardly even know it's there, it has such a subtle taste. 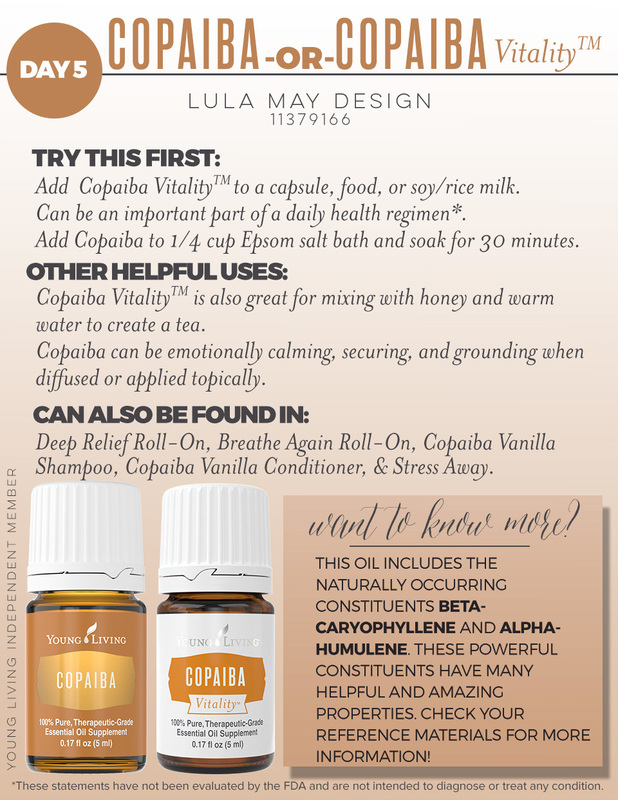 Try Copaiba at bedtime too. Combine this with some Lavender and Frankincense for some incredible sleep and supported emotions. Copaiba is 40% beta-caryphllene (BCP), put that word in google and see what you get. Most products containing BCP only have 17% and we have 40%! Yes!!! 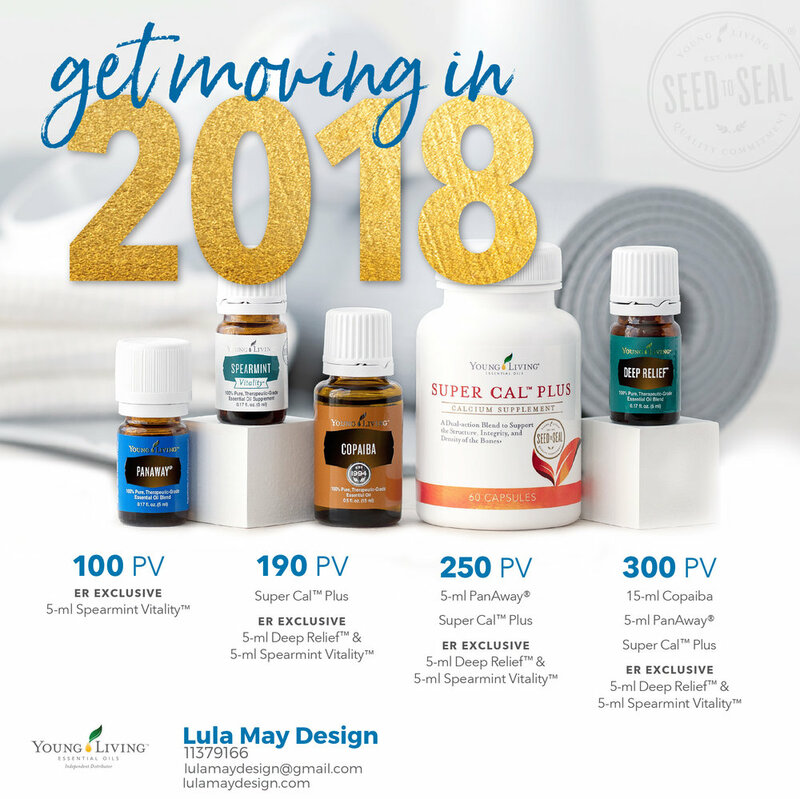 With a 300PV Essential Rewards order you will receive Copaiba, PanAway, Super Cal PLus, Deep Relief and Spearmint!